If you are a person who needs to use the computer while laying In-Bed or knows someone needs this capability this is the desk especially for you. This detailed plan with six pages of illustrations and these construction notes. As you can see this desk has been built and used successfully. It is designed so that it can be built by amateur wood workers using only a few hand Tools and at a reasonable cost. It features the use of factory sized lumber and mouldings thus eliminating the need for a heavy power saw. All the Materials can be bought at your local home improvement store for about $175. If your bed does not have space underneath it, please look over our Attached In-Bed Computer Desk. This design includes six detailed sketches. You can get them with this little form . Pictures of this and most of our other projects can be seen in our Picture Gallery . Hand cutting and drilling the frame pieces. Hand lapping the threaded rod and nuts. You may obtain any of these plans by simply sending in this little freebie form. After you request the sketches, these notes will help you understand them more completely. The sketch shows the side and end views with the shelves in the store position. The base is on casters like a grocery cart, it is weighted, and it pushes under the bed. The desk top computer is in a protected area that is just beside the bed. 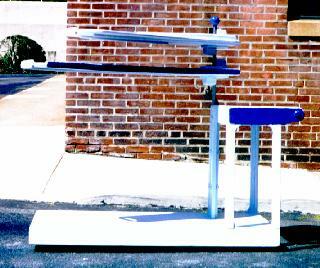 The desk is pushed around with a large diameter dowel handle. The keyboard and mouse rest on the lower shelf that extends out over the user's lap area. This shelf rotated around a support rod so that it can easily be pushed out of the way. The monitor is on the shelf which also rotates. This design can accommodate the heavy old-style CRT monitors, but the newer, lighter weight, flat screen monitors are much easier to work with. Both shelves can be adjusted in height. This sketch shows two top views of the desk. The monitor shelf is in the 'Stored' position in the first and in the In 'Use' position in the second. You can clearly see the large dowel handle. 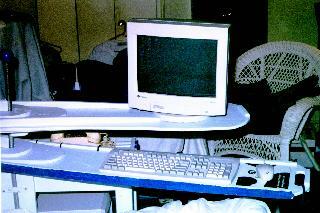 The small chain between the shelf allows the user to pull both shelves into position using only the keyboard shelf. This sketch the view bottom of the desk base and the plywood top of the base. The ends of some upright pieces pass thought holes in the top and screw to the frame. The frame is made from 1-by-4's with 1-by-3 internal strips to mount the plywood top and bottom. There are four double thickness squares at the corners to set the casters at just the right height. This sketch shows the individual pieces of the frame. These parts can be formed by hand with a miter box and saw. The few dado slots can be cleaned out with a hand chisel. All the horizontal pieces are 1-by-4 lumber with 1-by-2 strips nailed to them. The long side pieces have dado slots at the end to make a nice joint with the end pieces. The top side pieces have a hole and curved to suit the dowel handle. These pieces are also dadoes. The upright side pieces are 1-by-3's and 1-by-2's. These are notched to fit with the frame. The upright member that holds the threaded rod is made from two pieces of 1-by-3 and one piece of 1-by-4. The rod is held in place with three pairs of 3 inch mending plates held with bolts and screws. The shelves are made from pieces of plywood stiffened with pieces of standard molding. The area around the shaft is also thickened and stiffened with disks of plywood. The plywood can be cut with handsaw or a jig saw. Six pieces of .5 in.-by-.75 in. rectangular molding stiffened the shelves. There are also short pieces to make handles at the end and to locate the monitor. The monitor shelf is also stiffened with two pieces of 1-by-2 on top to support the greater weight of the monitor. These pieces can be tapered or left square. This sketch shows the layout of the one piece of .5 inch plywood used for this desk. The cuts shown can be made at the store so that you can more easily get the plywood home The first cut splits the sheet exactly in half lengthwise. The second and third make the top and bottom of the base. You can purchase four 24 by 48 inches precut pieces. This desk is made of a lumber frame with plywood panels and trimmed with mouldings. The parts are assembled with glue, wood screws, and Finishing nails. The mechanically parts are simply made from a large threaded rod. The cost estimate below is clear pine and trim. This is only an estimate (made in the January 2000). The price may vary in your area. Getting a good price on the lumber and plywood is critical to keeping the price down. This desk was designed to be build using only a few hand Tools that a home owner might have, purchase at reasonable cost, or borrow. These Tools are all useful for general around-the-house maintenance and can fit in a tool box. If you want the supplier to make the cuts, have the drawings with you and double check the measurements. You will to buy the plywood even if you make a mistake. Mark all the pieces with the sheet number and description using a pencil by writing on the 'C' side. Keep all the scrap pieces. Cut #1 should be exactly down the center of the plywood. If the pieces are not exactly equal in width, use the widest for the top of the base. You can get the nuts to runs very smoothly on the rod by lapping them with water based valve grinding compound. This paste is available at auto supply stores. Use a punch to put one mark on the top of the top nut and two marks on the top of the bottom nut. After lapping they must be installed in the same order. Put a little compound on the treads and run each nut back-and-forth over the top foot of the rod. This process takes about 15 minutes per nut and works very well. Remove the nuts and clean them with soap and water and a scrub brush. An old tooth brush works well inside the nuts. All the grit must be washed away. Dry the part thoroughly. The nuts will now run smoothly over the rod. After final assembly you can apply dry lubricant (graphite). The base pieces are shown in Sketch #4 and are made from 1-by-4 (3.5 inches wide), 1-by-3 (2.5 inches wide), and 1-by-2 (1.5 inches wide) shock. These pieces can be easily cut with a hand saw and miter box. You may want to adjust the lengths of the bottom sides and end pieces so that they exactly fit your exact piece of the cut plywood. Assemble four up-rights. All four 1-by-2 pieces are notched the at the bottom and top. Trial fit the pieces and nail and glue the 1-by-2's to the 1-by-3's. You can drill holes for tie wraps along the uprights if you like. The lower base joints are shown as with the ends let into the sides. You can do this by cutting a saw cleft .5 inches into the wood and cleaning out the waste wood with a chisel. Counter sink the nails so they can be filled later. There are four wheel wells at the corners to accommodate the casters. These are made from eight 4-by-4 inch pieces of plywood and short pieces of 1-by-3. The bottom plywood is cut out for the wheel wells. Install the cross-piece and continue the 1-by-3 around the inside of the frame. Cut four small notches in the top piece of plywood for the upright extensions (the center slot can be cut later). Trial fit the uprights then nail and glue the plywood top in place. Cut the four top side pieces. Again notches can be cut with a hand saw and miter box and the waste removed with a chisel. The large holes for the handle can be cut with an adjustable bit or with a hole saw. The curves can be cut with a jig or coping saw. Assemble these parts into a rectangular box and fit the plywood shelf. Note the holes for cables. Assemble the top frame and shelf with nails and glue. Trial fit the uprights. Screw and glue the up-rights in place. Install the eight chair braces. Cut the notch in the plywood for the rod support pieces. Screw and glue the two 1-by-3's to the top shelf frame and the lower cross pieces with space between for the rod. Nail and glue the 1-by-4 in place behind them. File the two holes in one of each pair of mending plates to accept the square part of the carriage bolts. This is easily done with a small diameter round file. Drill holes for the six bolts and install the mending plates with the bolts and screws. Check the fit of the plywood base bottom and hold it with a few screws but no glue. Cut out the plywood shelf parts and drill small pilot holes where the rod will be. Cut out the four plywood disks and the four plywood eggs. Again drill only a pilot hole in the center. The egg shapes give extra stiffness to the shelves. Nail and glue the disks and eggs to the shelves with an alignment nail though the pilot holes. The larger eggs go next to the shelves. Cut the eight handle pieces of .75-by-.5 inches and install them at the ends of the shelves. Cut out the hand hole in the keyboard shelf. The plywood may be curved up slightly. Mark the top of the shelf so that the curve is up. This will help off set the weight of the monitor. Cut the six .75-by-.5 inches and the two 1-by-2 inch stiffeners for the shelves. Taper the two 1-by-2's. Nail and glue the four keyboard shelf ones straight along the sides. Install the top 1-by-2 stiffeners with screws and glue, against the disk and slanting out slightly. Trim the bottom stiffeners and install them directly below the top ones with nails and glue. The nuts are 1 in. face-to-face and 1.125 in. point-to-point and about 2.125 in. tall. A 1 inch hole will make a tight fit on the nut but you can pull the tie nut into the plywood assembly using the threaded rod, two flat washers, and a regular 3/4 inch nut. The holes must be drilled exactly perpendicular to the shelf surface. A drill press works best for this but you can do it by hand, if you are very careful to drill straight. Drill a straight 1 inch hole through the whole assembly. Bevel both ends of the hole at least the thickness on one ply. Run the regular nut 6 inches on to the rod. Put the washers on the rod. Lubricate the washers and rod with graphite (keep it off the wood). Run the tie nut up on the rod and center it carefully in the whole. Pull the tie nut into the wood by turning the regular nut. Cut out the four Rod Blocks shown in Sketch #5. Each is made from two pieces of wood with a 45 degree angle cut on one end to form a notch for the rod. Scrap hardwood works best for these pieces. Cut the 45 angles on long pieces of wood then cut them to length. Screw and glue these together. Rasp and round off the corners. Temporarily support the extended end with a piece of wood and clamps. Make it as flat as possible. Place one of the smaller rod blocks on the top disk and press it had against the rod. Make the base. Drill two pilot holes in the front part of the block foot print. Drill screw holes up from the under side of the shelf. Install the block with screws and glue. Repeat this process with the three other rod blocks. Drill a .75 inch hole for the rod in the wooden knob. Take the shelves off for Finishing. This can be done by swing the shelves around and around. Round off all sharp corners with a rasp, block plane or sandpaper. Fill all nail and screw holes and the crack around the top plywood. Sand all flat areas. You may finish your desk any way you like. We recommend sealer and two coats of oil based enamel with an accent color down the sides. This seals the wood completely and makes it easy to clean. The plywood edges of the shelves need a little more preparation work. You can, of course, finish the desk to suit yourself. We recommend a two color treatment. The body of the desk should be a light color. We made the prototype a very light blue. The sides of the base can be a complementing color. A spit coat made of one part 3-pound shellac to five parts shellac thinner makes a good wood sealer and primer. Here its use is important in getting the paint to stick and in sealing the plywood edges. The exposed plywood edges of the shelves take some effort to seal. The end result should be uniform in texture and not have holes one place and excess filler another. First fill all visible holes with glue and wood splinters. Toothpicks work well. Do not force the wood splinters in too tightly, they should be a loose fit. Let the glue dry and sand with course paper over a wooden block. Fill with wood putty. Let this dry thoroughly and sand again. Seal with a spit coat. Sand again and refill. Sand again, seal again, and sand with fine sand paper. In the process you can round the edges of the plywood a little bit. The edges are now ready to be painted. Turn the base upside down. Remove the plywood bottom. Fill the front pocket in the base with about 50 pounds of clean, dry gravel. Rake the grave flat so it does not interfere with the bottom plywood. Reinstall the plywood base with a screw about every 4 inches around the edge and down the center board (no glue). Install the casters and be sure that the swivel casters do not touch the sides. If you put the swivels in back the desk will handle like a shopping card. Be sure to print your name, the date, and who the desk was for on the bottom of upper shelf. Spin on the two shelves and adjust them to the desired height. Glue or double stick tape on the knob. This desk will probably need extensions for all the cables and may need a short extension for the monitor power line. Do not install the cables pulled tightly. You might have to use a six foot extension to get an extra six inches. Place the monitor on the top shelf. Cut four pieces of .75-by-5 inch molding and shape them to fit tightly around the base of your monitor (no glue). Or you can remove the plastic base of the monitor and screw the base to the Monitor Shelf and reinstall the monitor. Place each piece of the computer in the In-Bed Desk one at a time. Route and connect the cables. Dress the cables neatly down the bottom of the shelves and inside the up-rights using tie wraps. Do not pull the tie wraps too tightly. The cable should be able to slide back-and-forth a little. Trim off all the tie wrap ends. Be sure that the cut off ends of the tie wraps on the keyboard shelf do not point down as they will catch on the bed clothes.